Vogue is a range of armchairs and sofas that well suit with all kind of combinations: shape with a traditional lines or chaise lounge composition. 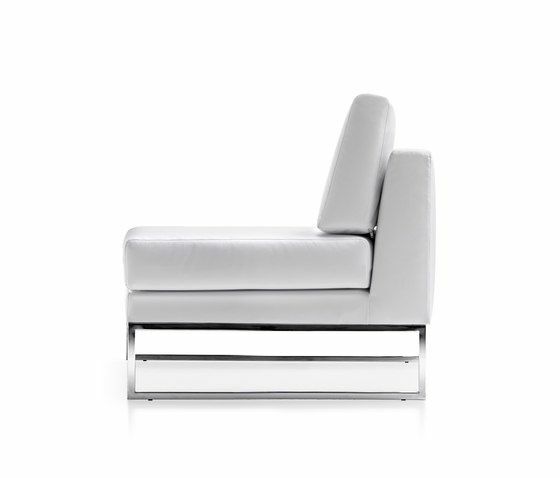 The upholstered cushions, with variable density padding, are collocated on a metal square structure (for single or double modules), available in the traditional chromed finish, black matt or white painted. A full personalization is allowed by the elaborate leather or fabric coverings. The collection is also comprehensive of lower tables with tops made of well-refined materials. Vogue is a modular system of sofas which, thanks to its expressive versatility lends itself to realize linear combinations that are dimensionally and stylistically varied. The simplicity of its lines and versatility of the structures that characterize all the elements of the range, ensures a comfortable and fast linking device of all modules and a simple configuration of them as well. Vogue is ideal for the living room, waiting area, hall or office.